About me, hmm, that's easy... I'm a 57 yr old married woman with a 30 yr old daughter who actually got me into the world of Anime and fanfiction 13 years ago. I live in the mid west in the US and am disabled with too many things going that I will not bore you with the details. Suffice it to say, I am bedridden often and my laptop (a gift from my loving husband) keeps me in blissful happiness reading fanfiction. 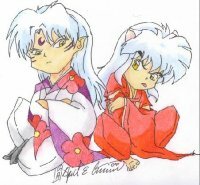 My favorite pairing is Sesshoumaru and Kagome. I am not a writer and I don't believe I'd even try but I do love getting caught up into this world of fanfiction and encouraging writers I believe have talent. I have a wide range of things I enjoy reading so I can't pinpoint just any one type. If a story peaks my interest and is written with some semblance of order and sense I read it and review it because I feel that if you took the time and effort to write and post the story, you deserve the opinions of the readers. I am saddened that too many readers don't take the time to at least jot down their approval if they did like the fic, it encourages the writers to broaden their skills. So, this is me and you writers here in this world are one of my biggest reasons for living. Through your imaginations I get to go places I can never go and enjoy each new adventure you take me on. I can never express enough my heart felt gratitude for your gifts of writing you do for free and I will be a fan for as long as you continue to write and allow me to go along for the ride and for you who review so often, I enjoy reading your reviews as much as the writers. You all encourage me more than you know. You're the best! Thanks for reviewing Killing the Cell Phone! It's good to know that it was the first thing you read in your journey back to Dokuga fanfiction.. It makes my lil ole heart swell and my ego expand! lol I do hope Killing the Laptop doesn't disappoint. I wrote it some years ago and only recently edited it here and there. But anyways!!! Thanks again for reviewing! Thought I'd sign your profile book! Your latest review for MBSL chapter 16 was insightful. The issues are difficult and will have to be dealt with cautiously. There will be a lot of hurt everywhere, but I believe in happy endings. You know you are one of my greatest inspirations and I will definitely continue with the story. Thank you for the review on My Bitter Sweet Life. Oh my, what a review. I can honestly tell you that I agree with your analysis, however, I don't believe Sesshomaru will take all that she has done to him, good or bad lying down. That's not who he is. He realizes for the first time the great risks involved when you open up your heart to someone, they can bring you immense joy and also terrible pain. And that my dear will make him react badly. She can't stay away forever, she still does have a conscience and in spite of her choices she still loves him dearly. What will happen when she returns? He did say that he would move on...What exactly does that mean??? Thanks for the review my friend. Thank you for your lovely review. I'm glad you enjoyed the first chapter of Chaos Theory, and I hope you'll keep on reading. And thank you for the well wishes. It means a lot! We never do think things through when we are young and feeling cornered. I know I've done many mistakes that now seem very stupid. I guess youth is all about impulses and bad decisions. Actually I was referring to Tensaiga Sesshomaru's sword so the spelling is correct. Nowhere in the manga does it say that Sessh's sword can break a barrier, but my thinking is that since the sword is of a spiritual or heavenly nature it should be able to assist him in instances as these. In a previous chapter I had said that Tensaiga had strengthened him while going through the barrier but then had lost it powers because of the dense porportion of the spiritual fog. His sword didn't actually break or shatter the barrier like Tetsuaiga/Tessaiga would, it made a dent or a fissure and he squeezed his way through. Ko thought that he could easily defeat the demon lord because he knew that the barrier had severly weakened him before. What he didn't know however was that Kagome had given Sessh some of her blood and it had aided him. And furthermore he still believed that even with half his power he could still win. In the case of the island, the spiritual force surrounding it was there to enable the fruit to grow within purity and to shield it. When the plant grew and the fruit bloomed and was plucked the energies there started to subside. Sessh can now freely leave the island without a problem. Hope I have answered your questions. Thanks for the review! Feedback from Tana_san: Thanks, that's answered those questions easy enough. But you still spelled Tenseiga with an ai and it should be ei. Oh heck, who really cares anyway. We all know who or what you're referring to. I didn't give it a thought that the fruit having been grown and picked would have weakened the barrier around the island. Thanks! Hopefully I clear away the fog of confusion soon! Right now there is a lot that is happening, and it will feel confusing. I'm trying to balance the line of giving away some while keeping most hidden for the reveal. I think I can clear away some right now though. So, chapter three is what really happened right after chapter one. When she called his name and he responded, he really did almost off her. He really does think she is a traitor (and hopefully chapter four will shed more light on that). They really are bound. Sesshomaru doesn't understand how they are bound, he's blaming her right now, but that will be explained later. Chapter two should be more thoroughly explained in chapter four. *fingers crossed*.. Thank you so much for your review of 'Invictus' Jen! I enjoy reading you input. I was so surprised when I saw the review that you posted for Object of my desire, thanks my friend. Oh well I am not sure if cold showers work on us ladies lol! Thank you so much for your feedback on "Invictus"! I'm so glad you pointed out that 'lacks' really needed to be 'lax'. When I was writing it, I looked at it for at least ten minutes trying to figure out why it looked wrong. Lol! Also, I know exactly what you mean by hating and loving this kind of fiction. The angst and suspense are painful at times. But most important, I'm extremely pumped you have fallen deep enough into the story to guess parts of the plot! I think you're in for a surprise next chapter. *Spoiler- It will be from Sesshomaru's point of view-* Happy reading! Thank you so much for leaving a review on both The Hime Tradition and His Milstone! I love your reviews! The one left on The Hime Tradition was very deep and made my heart melt! You just understood what was going on. And for His Milestones I am so glad you like the idea of time travelling. I wanted this story to be unique! And thank you for liking Rins importance. I thought this was the only way to connect Kagome and Sesshomaru together. I hope you will continue to read future chapters!